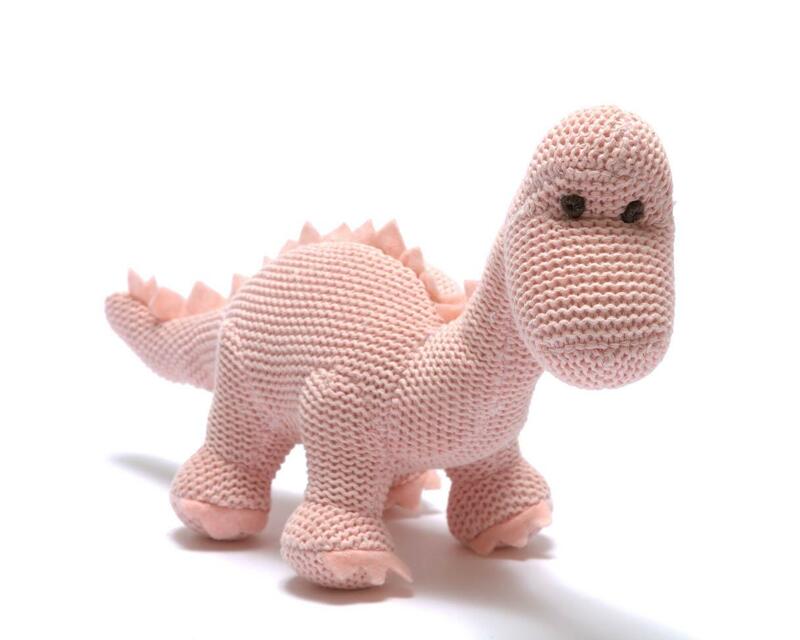 Tactile sweet pink diplodocus dinosaur with a soft rattle. A great baby gift for young babies. Baby Diplodocus were born from eggs laid in underground nests to protect them. We don't know what they looked like when they hatched but we don't think that you could get Dinosaur toys much sweeter than our organic diplodocus pink baby rattle. Ideal if you are looking for unique newborn Xmas gifts. Please note that sizes are given as a guide only and can vary. Best Years are a soft toy manufacturer based in the UK. All of our baby rattles are available to wholesale, retailers and museum customers. Available colours: pink or blue. Have you seen our range of New Baby Rattles and Greetings Cards?